In this story, Victoria’s favorite place on earth to visit gets another powerful memory added to it by a cunning move from Ryan. We met at work, realized we both grew up in Indiana, spent some time in Wisconsin, and then family brought us to Denver. We talked about how we both love to travel, and were amazed about how much we had in common! I didn’t know how we would exchange contact information because we were in a very professional setting, but Ryan was thinking pretty quickly on his feet, and we ended up reconnecting about 3 weeks later. On our third date, a week after our first date, we went on a camping trip with his (now our) friends for the 4th of July. On the drive up to Monarch, while we were talking about our futures and passions, I saw him as my future. When we first met, we spoke a lot via IMs because Ryan was traveling abroad at the time. We talked about our favorite places and exchanged photos. Ryan’s was Yosemite because he lived in Sacramento. My favorite place can be pinpointed to an exact coordinate – in Lake Louise, Banff National Park, in Alberta, Canada. Everyone knows the normal “National Geographic Photo” of Lake Louise, taken from the Chateau, where the lake is at the base of the Plain of Six Glaciers. My favorite place in the world is at the opposite side of Lake Louise, at the base of Plain of Six Glaciers, where the glacial waters meet the sediment and the water starts the turn blue. Fast forward 1.5-2 years, Frontier started offering nonstop flights from Denver to Calgary, and Ryan jumped on the chance to suggest a camping trip. I was ecstatic, because I have always wanted to take him there, but didn’t know how the logistics would work. I planned the same hike I had done years ago (Lake Louise to Lake Agnes to Plain of Six Glaciers back to Lake Louise), and after that hike, I walked Ryan through the muddy, and glacially cold waters, and stopped at the shore. I breathed in, and told him that I’ve been waiting a long time to see this again. He held my hand and told me he had been waiting his whole life for this moment. I have always wanted a cushion cut diamond, something different from the classic round, but not as sharp as the princess. 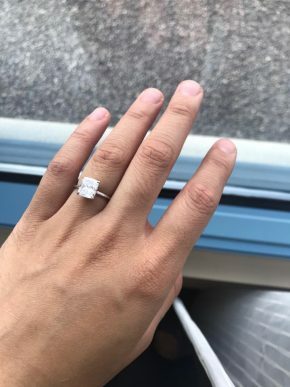 I collected a plethora of photos of rings I liked, and when the time came, I showed them to him. He actually picked the one that was my favorite, and that was pretty much it. 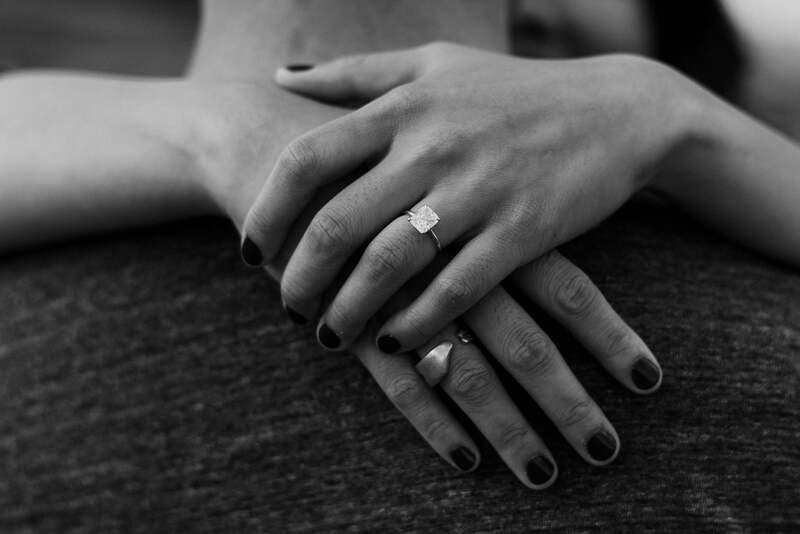 We agreed on a setting that focused on the diamond and nothing else – super simple, and super modern. We met in a professional setting, shortly after both of us had just re-located to Denver. I tried to play it cool and hide how much I wanted to take her out. So.. I suggested we find each other on LinkedIn, because who asks someone out like that these days? I knew instantly, the moment I met her. The way she smiled, spoke with me as if we’d known each other our whole lives, I knew that there was something very special about her. We love to travel and so it was only natural I plan something away from home. 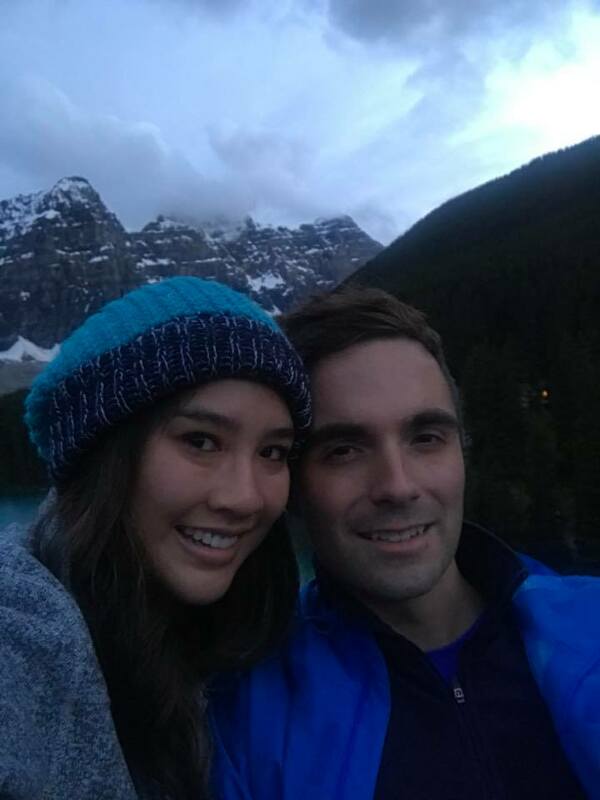 I knew that Banff National Park was her favorite place to hike and I suggested, nonchalantly, that we make the trip over a long weekend. 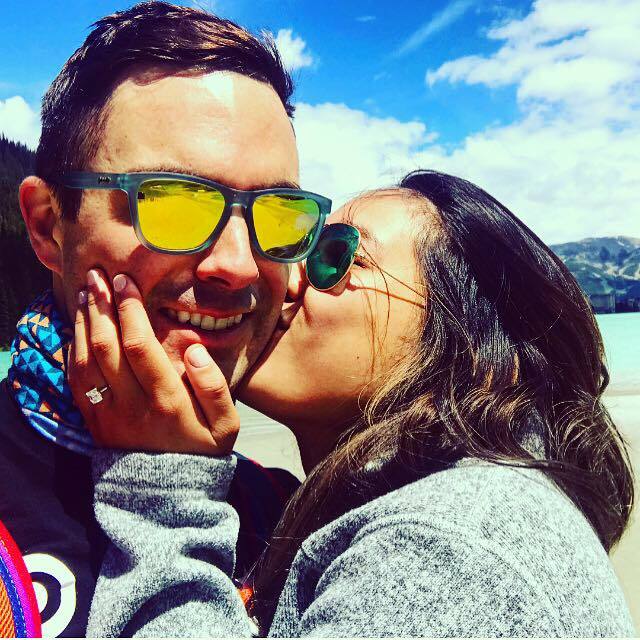 After hiding the ring for several weeks, bringing it across the border and hauling it as discretely as possible on a 10 mile hike, I proposed on the shore of Lake Louise on a beautiful summer afternoon. I’m sure my significant other can tell you all the details but I went into it knowing that I wanted something unique, elegantly simple and modern. Beyond that, I knew very little. Kaeleigh did a fantastic job bringing me up to speed, chasing down potential options and ultimately helping me find the perfect ring. I couldn’t ask for a better experience.